Based on data from the Department of Transportation's Fatality Analysis Reporting System (FARS), this map plots the location of every fatal U.S. traffic accident from 2004 to 2013. 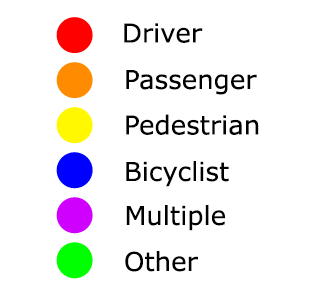 When zoomed in, each icon's shape and color represent information about the person whose life the accident claimed. Among the accident causes reporded by FARS, these three stand out as being both highly significant and preventable. Alcohol was a contributing factor in 31.1% of fatal accidents, speeding contributed to slightly more - 31.2%, and distracted driving was involved in 17.6% of fatal accidents. Upon zooming in the map, a panel will appear that allows you to highlight icons by contributing factor. To view the accidents that occured in your neighborhood, you can search by address using the search bar in the upper right corner.